.38 Fiocchi wadcutter won't eject? When I first shot my S&W 52-2 last week I used http://www.sportsmansoutdoorsuperstore.com/products2.cfm/ID/135372/23848dt/3d-inv-inc-38-special-148-gr-wadcutter-police-trade-50box and everything worked fine. Then I used a Fiocchi 148 gr. wadcutter and all but a few out of about 30 did not eject. They just hung up in the chamber. What causes this, too weak a charge? Re: .38 Fiocchi wadcutter won't eject? Standard recoil spring is 8# in the M52. If you are going to shoot that cheap low powered "stuff" then maybe get a 7# recoil spring from Wolff. Then maybe then it may function ? I very much love my M52 and would never load it with anything other than quality Remington, Federal, Winchester 148gr wadcutters and of coarse my own special reloads. Nothing worse than spending good money on a great gun and feed it crap. This makes you feel that you purchased an unreliable gun, but in reality it is what you are feeding it is what it was not designed for. Build or shoot ammo that is required in your gun for it to function as designed. Fiocchi makes great ammo BUT they like all mfg. have their lower end stuff. Their 38 load may be on the weak side or their case size might be more to the max side of the spec. either one will give the 52 fits. Go with what Clarence says. Get some Remington, Federal or Winchester 148 gr wadcutter ammo. My Model 52 shoots very tight groups using Remington 148 gr TMWC (Match) ammo. If you load your own, use 148 gr wadcutter bullets and 2.8 gr Bullseye powder as this is the classic load for Model 52's. Either Zero or Penn Bullets can supply you with 148 gr wadcutter bullets. I looked up the 3D INV INC 38 Special 148 gr Wadcutter Police Trade ammo and IMHO they are for revolvers. Generally wadcutters for police revolvers have a lower powder load vs. factory mid-range target wadcutters that are intended for either revolvers or pistols, such as the Remington ammo. As the proud owner of two Model 52s, it is without a doubt the most accurate production pistol S &W ever made right out of the box! Even between Remington, Winchester & Federal 148gr WCs, there can be significant drop offs in accuracy. One of my 52s loves Federal and hates Remington & Winchester--all factory match. The other 52 Hates Federal and Remington, but loves Winchester Match--go figure. Also tread lightly with reloading for a 52. Finicky would be an understatement. Difficult to work up a load that will perform without the bullets tipping. More tipping was apparent at the long line vs. the short line. Gil Hebard (RIP) wrote a great piece about reloading for the 52 and spent a good deal of ink discussing bullet tipping issue. I still have the article if interested. According to Gil, the 52 is the most difficult pistol to develop an accurate reload for. But, toward the end of the article his sense of humor shows when he says that there is an upside to bullet tipping, 8s become 9s, 9s become 10s and 10s become Xs due to the elongated bullet hole---resembles skidders. ALLAces has provided some good data: "148 gr wadcutter bullets and 2.8 gr Bullseye powder as this is the classic load for Model 52's." I'd start with 2.7 of Bullseye and work up using a Ransom Rest. To the best of my recollection about 3.2 of Bullseye with 148gr wadcutter is max or close to it. I had the best results with 2.7 Bullseye and Speer 148gr WCs. IMO, stick with factory 148gr WCs, preferably match, for now, because working up an accurate load will take a lot of bench and range time, laced with much frustration and hair pulling. Usually Champion's Choice, Champions Shooters or Midway have 148gr WCs in stock because most .38 shooters thumb their noses at 148gr WCs. Hope this is helpful info. My buddy's 52 likes Rem-UMC brass with 2.5-2.7gr BE under 148gr HBWCs. We've used Zeros, Hornady, and one other bullet that I can't remember. Pretty much everybody I know finds the best result at 2.7gr. The only reason we ran the 2.5 grain load was because I had a box made with that load for my revolver and he needed some. Beeser - I pulled out some of my old reloads. I used Hornady 148 gr hollow based wad cutters over 2.7 gr of Bullseye. The last time I reloaded for that gun was 2002. Too late Rob, brassmaster already said I should get a Ransom Rest. I checked Champion's Choice, Champions Shooters and Midway and all are "out of stock" on .38 special wadcutters good stuff. I'll have to do some more searching but I agree that I'll stick with the factory ammo for a while. But I don't see there's any reason why I can't begin the process of at least finding and ordering bullets and cases. The powder is already on the way. 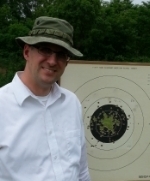 Check with Neil at http://www.nsksales.com/ as he may have some wadcutter ammo. swissyhawk wrote: Beeser - I pulled out some of my old reloads. I used Hornady 148 gr hollow based wad cutters over 2.7 gr of Bullseye. The last time I reloaded for that gun was 2002. Oops! Didn't see at first the author. Gun is working out great and I'm really glad to have it. Thanks again! As much as I hate Sportsmans Warehouse they are showing both Remington and Winchester 148 grain WC in stock for under $30 a box of 50. I refuse to buy anything from this place but your feelings may be different. I tried to order these (H10208) and couldn't find any. Bullets seem just as hard to find as ammo apparently. I'll keep searching. Virgil Kane wrote: As much as I hate Sportsmans Warehouse they are showing both Remington and Winchester 148 grain WC in stock for under $30 a box of 50. Thanks Virgil! I just ordered some of both brands. Surprised the Winchesters were so much more.